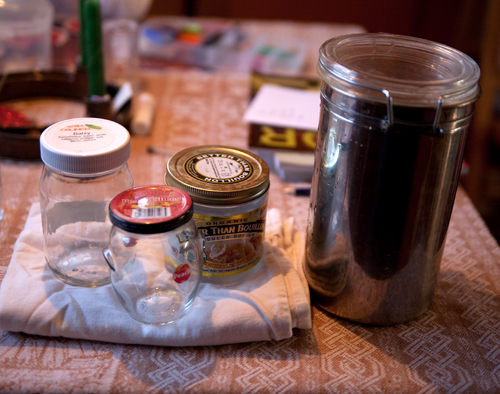 Katie and I have found a ton of inspiration from the Zero Waste Home, a blog that focuses on eco-friendly solutions to a trash-producing lifestyle. Katie created her own kids’ lunch bags and I’ve been composting a majority of our kitchen waste, plus making my own granola and yogurt. The blog is a big supporter of bulk shopping — including bringing your own containers — so on a recent trip to Whole Foods, I decided to try this out myself. I’ve been shopping in the bulk section for a while but have usually used their plastic containers and bags. I already bring my own shopping bags, so why not bring a few containers as well? The first thing I did at the store was to weigh my jars on the scales in the produce section. I wrote the weight on the jar with a Sharpie I brought from home. My thought was that the person at the check-out counter could subtract the weight of the container from the total weight to get the accurate price of the items. I filled up my jars with dried fruit, coffee beans, and rolled oats. 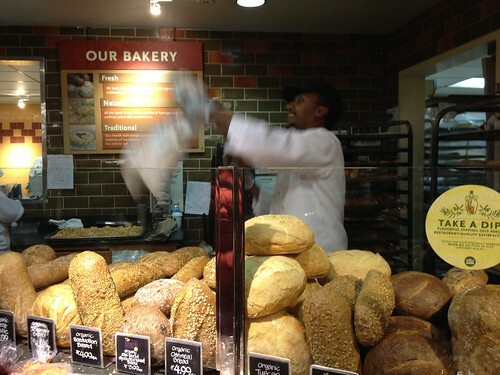 Then, I hit up the baker for a loaf of bread. He didn’t bat an eyelash when I asked him to put it in my kid-decorated pillow case. With a smile, he handed me the sticker to put on the outside for check-out. Sweet! But when I got to the check-out line and proudly lined up my containers, I watched as the check-out person become completely flummoxed — he was charging me for the weight of the cannisters AND the items. Imagine my shock when I found out a pound of coffee beans rang up to be over $30! As I debated the obscene prices with the check-out person, the line behind me grew to two and then three (restless and annoyed) shoppers deep. Finally, the customer service rep came over and told me if I wanted to bring my own containers, I needed to first stop by the customer service desk so they can weigh the containers and mark them. Lesson learned. 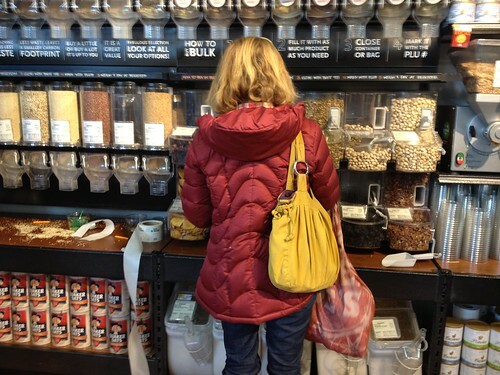 After the “incident” at Whole Foods, I also stopped by MOM’s Organic Market to check out their bulk offerings. Before shopping, I made sure to stop at the customer service desk first. To make things run more smoothly at the the check-out line, the employee pushes a button for “tare” (the net weight) and enters the bulk item number and the weight. The computer does the rest. It’s amazing the range of items you can buy in bulk: spices, grains, nuts, raisins, rice, beans, flour, oats, cereal, honey, oil, salt. The list goes on. You can get milk in glass bottles that you pay a deposit for; then, you bring the bottle back and you get your deposit back on the next bottle you buy. 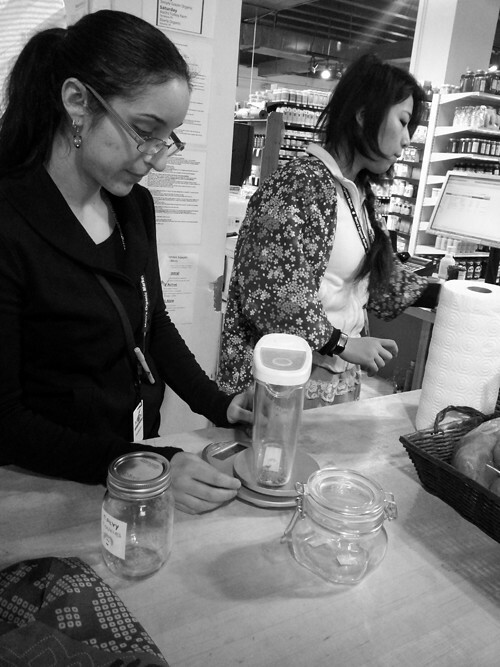 Remove old labels from your jars, especially the bar codes so the scanner doesn’t detect it. The label should only show the weight of the empty container (tare) and the ID number of the item. Avoid heavy containers and glass, which will be harder to carry home. You can always transfer the items to nice-looking jars when you get home. 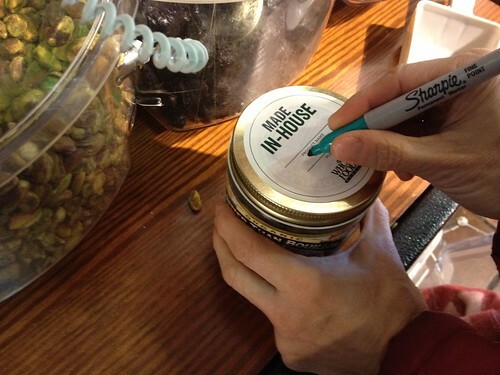 Keep standard plastic containers to use for shopping for, say, raisins or coffee. Do you shop in the bulk food section? Do you know of other stores that have a good bulk food section? Those are great tips, thank you! I love the idea of having a label already ready to go. I can just picture the annoyed shoppers now! I would have been one of them. But this is very useful and informative – thanks! I lived in Brattleboro, VT for a few years and was privy to the Brattleboro Food Co-op there (pre-remodel). You could bring any container you liked, weigh it yourself and stick a tare weight sticker on, then a second sticker with the plu#, and the wonderful cashiers knew exactly what to do. They also sell 50lb bags of King Arthur Flour, which I haven’t been able to find here (except through a restaurant contact). So imagine my surprise three years ago when I showed up at MOM and they had no system for bringing your own containers. I think so few people were doing it at the time, they would weigh your container in a checkout line, then send you off to bulk. Hopefully if more people reuse containers, the process will become more streamlined. A little trust helps, too. This is a comment from a reader who asked us to post it for her: What an awesome article! 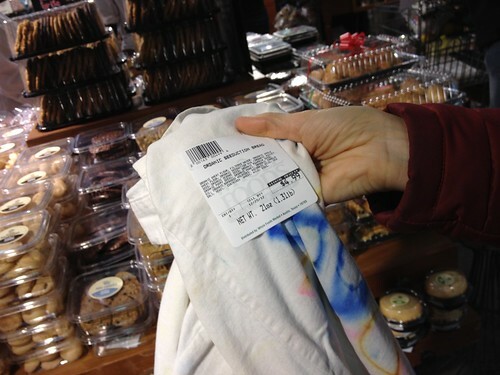 One suggestion, at Whole Foods you can occasionally find very light weight cloth bags for bulk items by “Mothering Mother”. These bags also include a tare weight printed on the bag. The bulk bags have a velcro closure that is really secure. I like them because I can store my items in them and then wash them when I am done. They are also easy to carry. I bet they would be easy to make with a sewing machine and you could find the tare weight once and write it on your own bag with a sharpie. The same company also sells produce bags, though I haven’t tried these. For some items, especially rice, I find the cheapest way to get them in large quantities are at Indian or Asian grocery stores like Grand Mart. I have also heard that if you freeze your bulk items over-night this kills off anything that may sprout legs later if you don’t use your bulk items quickly enough. I would be interested to know if anyone else has heard this as well. I appreciate this post! Thanks for sharing. On a related note, do you think there is a label of “elitism” attached to re-using things? And if so, why? I suppose a person’s response to that question depends on where they live and where they shop. I’ve never understood that sentiment, and never will. Someday soon, it will be normal to re-use items in such creative ways, without any stigmas attached. It’s simply the right thing to do, and ultimately it makes sense for the pocket book, too! Furthermore, it’s pretty darn easy. If people would just slow down just slightly, and take a few moments to consider how they can utilize things they already have, imagine how far ahead of the game we would be. It was really nice and must follow Idea I got from your blog. It’s necessary if you want the environment neat and green. I would love to follow your way.